From designer Mads Hindhede - he's Mads, Mads we tell you - comes the BabelFisk speech to text translator. Cool, huh? Oh - and it's a pair of glasses. Say whaaaat? Actually we could, and it would be automatically translated and projected onto the lenses of the glasses, along with a small directional indicator that would give you a rough idea of where the sound was coming from. Sure, it's no Universal Translator and while there are always going to be issues when converting text to speech -especially in a real-world in environment - we're thinking "what did you say about my momma" issues, the BabelFisk is a futuristic foray into what could just become the next big thing. Hindhede's concept glasses hearken back to an old-school, wide-rim model, complete with chunky arms and thick frames to hold all of the necessary technology. Sure, stuff is smaller now, but in order to make this potentially work, Mads had to cram a lot of junk in there. What junk, you ask? Well, for starters, there's the microphone on each side of the glasses, near the top outer portion of each lens. After that you've got your speech to text converter, video projectors and software, noise-filtering devices to cancel out non-conversational and useless noise, and of course your Lithium-Ion battery. All in all, the things don't even look that clunky for everything that's supposed to go in there. In theory, the mics on either side of the glasses are going to pick up a sound and run it through the speech to text software while simultaneously cancelling out and useless or random noise. 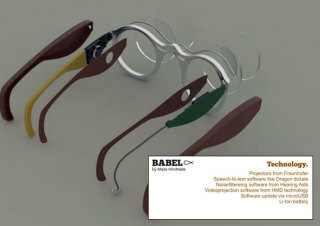 The resulting translation will be projected onto the surface of the BabelFisk eyewear, telling you not only what was said - in any language - but where in relation to you it was said. Sure, you're going to look a little out of the ordinary and your glasses might give you serious neck strain, but you're going to know for sure that those two foreign exchange students back there were talking about you. Is this a great idea? 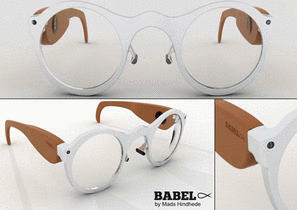 Yes - especially if BabelFisk technology can be streamlined to fit "fashion" glasses. So far, the biggest challenge we see is multiple conversations in the same room or close proximity, or a conversation with more than two participants. Getting a continuous stream of text, all unrelated, would be hilarious but not great for translation or knowing just what the hell someone is talking about purposes. Still, the beauty of the design is easily understandable. Slam Out Perfect Slammers With The Burger Stomper!